SharePoint site collection administrators have Full rights to all sites within a site collection. Primary site collection administrator and Secondary site collection administrator specified in central administration will automatically become site collection admins. Its also possible to add multiple site collection admins for any SharePoint site collection. 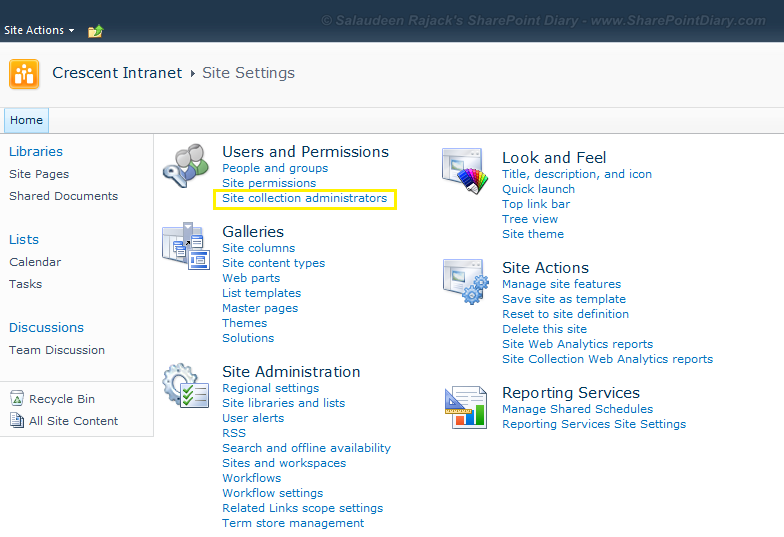 How to add site collection administrator in SharePoint? To add site collection administrator in SharePoint, you must be either Farm Administrator or another Site Collection Administrator of the site collection. Navigate to Site Settings >> Click on "Site collection administrators" link under "Users and Permissions"
which will lead you to a page where you can manage site collection administrators. How to Add Site Collection Administrators Programmatically with C#? Write-host "User: $($userAccount) has been added as site collection administrator!" So with the Power of scripting, we can add site collection administrator to all sites.